Starting from 122.90 EUR* single unit price! Get your BeagleCore™ BCS1.STR Starter-Kit consisting of BeagleCore™ BCM1 module and standard baseboard. Both are 100% Open-Source! 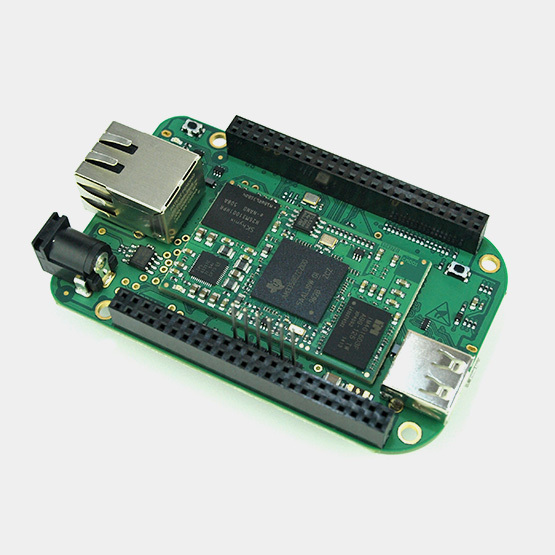 The BeagleCore™ BCS1 baseboard is built to resemble the original BeagleBone Black just with the difference that at its core you will find our BeagleCore™ BCM1. The word »BeagleCore« is a trademark owned by New Technologies GmbH, in short referred in this document to "a BeagleCore trademark". Written permission from the New Technologies GmbH is required to use any of the BeagleCore trademarks as part of your project or associated assets. If you would like to enquire about permission for use, please use the contact form to get in touch with us. The purpose of our trademark is not to prevent people from using it, but to avoid confusion amongst consumers as to which brand is the "official" one. Our primary criteria for the approval or denial of trademark usage requests is whether or not people might confuse it for an official BeagleCore™ project. Furthermore the trademark of the name BeagleCore™ does not harm the principles of the Creative Commons CC-BY-SA 3.0 licence that is – except where otherwise noted – the foundation for all contents on this site.